The Maldivian government has introduced a new anti-terror bill in parliament, basing it on the “Islamic” definition of terrorism in a bid to stifle dissidence. In the United States, the term is defined as any activity involving two things. One, “a violent act or an act dangerous to human life that is a violation of the criminal laws of the United States or any State.” Two, that act should also appear to have one of the three intentions: to intimidate or coerce a civilian population; to influence the policy of a government by intimidation or coercion; to affect the conduct of a government by assassination or kidnapping. However, Islamic and Muslim-majority nations have their own definitions of terrorism. The 1998 Arab Convention for the Suppression of Terrorism, for example, states that terrorism is any act – or threat of violence – “whatever its motives or purposes,” that seeks to sow panic or fear among people by harming them or endangering their lives, liberty or security; or seeks to cause damage to the environment or to public or private installations or property, or to occupy or seize them; or seeks to jeopardize a national resource. The Convention makes an exception for fights against “foreign occupation,” apparently to allow Palestinians to carry on with their armed struggle against Israel. It also states that certain offences, even if committed for political motives, including acts of sabotage and destruction of public property and property assigned to a public service; murder or theft accompanied by the use of force directed against individuals, authorities or means of transport and communications, must not be treated as “political offenses” in the implementation of the Convention. A year later, the Organization of Islamic Cooperation, or OIC, seen as the largest bloc at the UN and comprising the Maldives and 56 other Muslim-majority nations and the Palestinian Authority, adopted a similar definition of terrorism, at the OIC Convention on Combatting International Terrorism, signed in 1999. The OIC Convention also exempts acts committed in “peoples’ struggle, including armed struggle against foreign occupation, aggression, colonialism, and hegemony, aimed at liberation and self-determination,” but does view certain politically motivated acts as terrorism. There are at least two key differences between how terrorism is defined by the UN and the OIC, which views the UN understanding of democracy and civil liberties as a Western agenda. First, the OIC definition excludes struggles against foreign occupation. Second, while the UN and Western definitions carefully focus on use or threat of violence with intent to cause widespread fear or influence government policy, the OIC’s definition includes acts that may pose a threat to stability, territorial integrity and sovereignty, irrespective of the motives behind those acts. One might say that these differences can be understood in the context of the historic tensions between the West and the “Muslim world,” wherein the latter seeks to strengthen the powers of the State due to a sense of vulnerability, but the fact remains that the OIC’s definition of terrorism can be misused to subvert democracy. For example, a nation can easily say that a political protest against the government threatens the nation’s stability and sovereignty, and is therefore an act of terrorism. This is precisely what the Maldives could do, even if the claimed intent of the anti-terror law is to counter the rise of Islamist terrorism in the country. The Office of Attorney General (OAG) of the Maldives, which drafted the bill to replace the Anti-Terrorism Act of 1990, has apparently sought to emulate the OIC convention, to justify and institutionalize the incumbent government’s ongoing attempts to curb dissidence by limiting civil liberties. The OAG showcased the need for new anti-terror legislation, citing concerns over Maldivian citizens joining terrorist organizations, including al-Qaeda and the Islamic State, also known as ISIS or ISIL, in Iraq and Syria. The archipelago’s police chief, Hussein Waheed, said in January that an estimated 50 Maldivians had gone to fight in foreign wars. 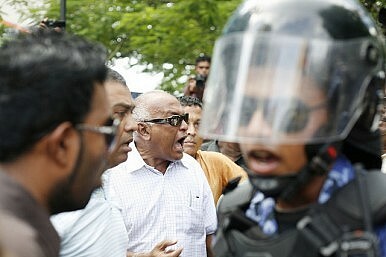 The opposition Maldivian Democratic Party (MDP) put the figure at about 200. The bill proposes a jail term of between 17 and 20 years for joining a foreign war, and 10 to 15 years for anyone who attempts to leave the Maldives with that intent. However, the offences listed as terrorism in the bill include crimes that can be attributed to non-Islamist criminals, or worse, to political activists – such as murder, causing bodily harm, kidnapping, damaging property, endangering public health or security, damaging public infrastructure, or causing a suspension of public services, if committed with the intent of (1) “unduly” influencing the government, (2) creating fear, or (3) promoting “unlawful” political and religious ideologies. Not everything that is unlawful can be equated with terrorism. For example, it might be against the law to organize a strike or a political protest seeking to change government policy. These acts might disrupt public services, but they are hardly “terrorism.” What about expressing views contrary to the official version of Islam – a more moderate version of Islam, perhaps, or atheism – would that, too, be viewed as terrorism? And who will define what are “unlawful” political ideologies? Further, the bill empowers the president, in consultation with the National Security Council, to designate any group as a terror organization. The Council, chaired by the president himself, comprises government ministers, the Attorney General, and a few other officials who report to the government, with no representation from the opposition or from civil society. Only the commander-in-chief of the Armed Forces, that is the president himself, can appoint temporary members to the Council. Moreover, the proposed legislation provides that terror suspects’ fundamental rights, including the right to remain silent and the right to access to a lawyer, can be restricted. The bill also authorizes the home minister to seek a monitoring and control order from the High Court to conduct surveillance of suspects, including minors, without their knowledge, according to a media report. The minister need only have a police intelligence report, and a judge can give authorization after determining whether the report carries reliable evidence. Given that the judiciary in the Maldives is known to be highly politicized, the consent of the court is unlikely to be difficult to obtain. The timing of the bill is also revealing. Former pro-democracy president and opposition leader, Mohamed Nasheed was recently controversially convicted under the existing anti-terrorism law of 1990 and sentenced to 13 years in prison. Terrorism charges were included in February, soon after the Jumhooree Party (JP), led by Gasim Ibrahim, an influential resort tycoon and earlier part of the ruling coalition, officially aligned with Nasheed’s opposition party, the MDP, along with several other lawmakers from the ruling coalition. The OIC might be seeking to safeguard Muslim-majority and Islamic nations against what it perceives as a “Western agenda,” but its definition of terrorism is helping its member states to victimize people like Nasheed and his supporters, who are not “Christians” from the West, but pro-democracy Muslims.